As a business, we pledge to honor God in all that we do, to serve our customers with the highest integrity, to help our employees develop to their fullest potential, and to pursue excellence in all that we do. 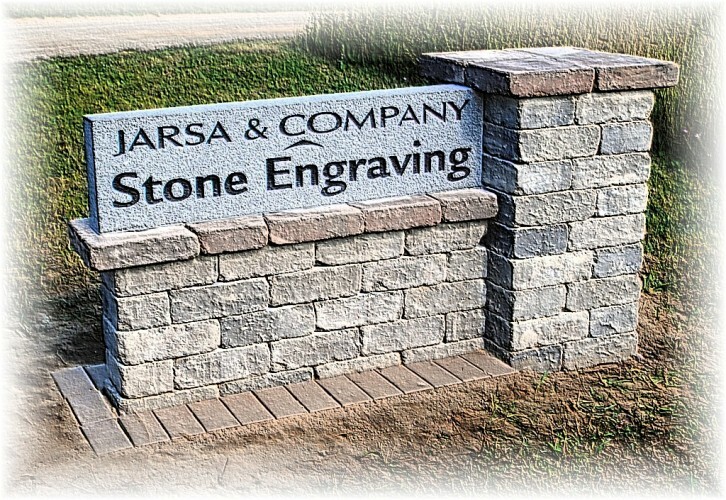 Established in 2005, Jarsa and Company Stone Engraving creatively blends art with technology to bring stone to life through memorials, engraved brick fund raiser projects, pet memorials, on-site boulder engraving and onsite cemetery engraving services. Since our beginning, we’ve been honored to participate in many public and private projects through-out Hillsdale county and the tri-state area (Michigan, Indiana, Ohio). Creativity and close attention to details are at the very heart of what we do. From small “pocket” rocks to large boulders, and everything in between, no two projects are ever alike. In addition to the stone engraving processes, we also have capabilities to assist our clients with project planning, typography, computer assisted drafting & design (CAD), graphic composition and design. We're committed to customer service excellence, and we invite any inquies you may have.